It’s three years ago this month since MOAS started operating. It was the first of its kind, a civil society search and rescue mission out to stop the deaths of refugees and migrants who felt they had no choice but to attempt the dangerous sea routes. This is the first part of a two-part Podcast that opens up this theme of civic action on the migration crisis. To do this, we’ll talk to a number of similar organisations and people helping refugees and migrants. We’ll find out what inspired them to do something and what kind of actions they took. What do you do when tens of thousands of refugees are travelling through your town, sleeping rough and braving sub–zero temperatures? 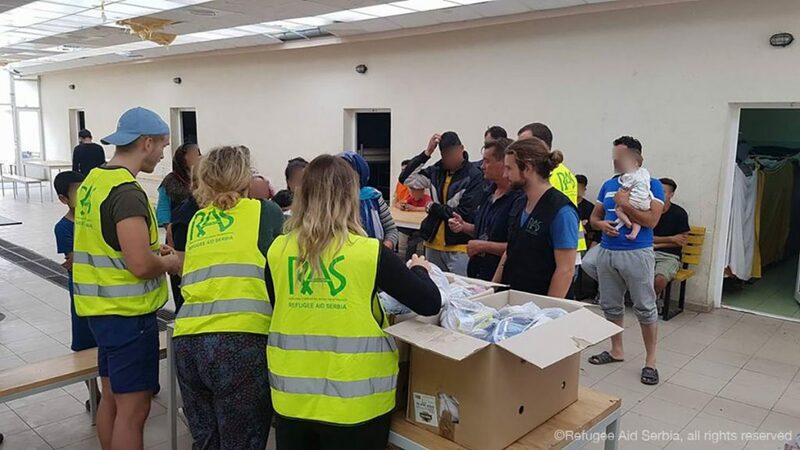 Well, Refugee Aid Serbia is a grassroots movement of local citizens and organisations that came together in August 2015 to provide aid to the many refugees on the Balkan route. Despite Serbia being a transit country their work has had to be adaptable to refugee’s needs. So, we’ve now moved as an organisation from our roots in humanitarian aid to expand to educational and recreational activities, so to that aim we’ve opened up a dedicated learning centre in Belgrade in the city centre which provides a variety of different classes. We do English language lessons, we’re expanding now into maths, science, and some basic things around Geography. We do, I suppose you could call them maybe, basic cultural integration classes and then on the recreational side of what we do it’s anything from art therapists, we have performance artists, and we’re trying to develop some of our schemes to do such things as IT literacy. So, it’s quite a flexible learning environment and obviously the people with whom we work, still considering this a transit country, it’s very hard to develop, let’s say, a long term curriculum for people whose goal is to only stay here for a certain amount of time before they leave. But we try and make sure our learning activities reflect their needs, their wants and their movement I suppose. How many people does the organisation help or support? It would be hard to say an accurate number unfortunately because a lot of the activities we do have to be flexible to the extent that, as I say, people will come and go depending on their situation. The example I gave earlier about our education centre; You can start theoretically an 8-week English curriculum with a family or with a series of students and then find at three weeks in they don’t come back; eventually they’re successful in either finding a smuggler who helps them continue their route or they’ve gone through one of the other legal means to either be resettled in this country or to go back to their home country through assisted voluntary returns or resettlement in a third country, both of which are very rare. So, it’s quite flexible. At our centre I think we’re teaching probably between 20 and 30 people a day, mostly regular students and, as I say, there’s some flexibility in terms of how long people stay. The distribution we’re doing is less of a prime focus of what we do now than what it was before. When there were very large communities sleeping rough still in the city centre we were giving both food and non-food items to around 1,000 people a day. The government then put in measures that suggested that NGOs should stop providing aid and assistance to refugees who were residing outside of the government camps. So, many NGOs curtailed their activities and about three months ago the informal structures in which a lot of people were still sleeping rough, because they had gone inside because of the Winter – the Winter here is about -15, -20 degrees – so a lot of the refugees who had been sleeping in the city centre and been sleeping in these abandoned buildings, warehouses, structures. Those were finally demolished as part of a real estate development project, I think it’s about three months ago now, at which point everyone was resettled into government camps. So again our activities which were really on the ground here in the city centre; we’ve now moved to government camps and we’re doing distributions in the camps but today, as a small example, we went to do a distribution in a camp on the Northern border with Hungary and we had been told by the camp authorities that there are 150 people there, by the time we got there, there was 80 because the remaining 70 had either been moved to other camps, had voluntarily left the camps or, as I say, continued their journey and had finally left Serbia. Can you tell me more about the Odyssey Project and what it aims to do? As I say, the whole thing will be filmed into a documentary, we’ll also be hoping to interview activists, NGOs, politicians and local residents along the route. So, as well as these routes festivals we can get a kind of global picture of the refugee situation throughout Europe and we hope that that can be a good educational tool that we can provide later down the road for people who weren’t with us on the journey but want to experience it. Another important aspect of civil society’s work is the integration of asylum seekers and migrants into their new home. Germany has a comprehensive process for integration. But, one organisation says housing, language and cultural courses just aren’t enough: you need to make people feel like they belong. Annamaria Olsson launched Giving Something Back to Berlin in 2013. …We’re using different projects to reach different communities because you can’t reach all people through one thing. So, for instance, the open art shelter is a project where we work a lot within the refugee shelters and the camps to kind of mobilise and create connections with more vulnerable and hard to reach communities like women and children that we don’t notice, that wouldn’t show up on our more public events that we’re doing outside. So, that’s also a very important part of our work. For some groups they need fast access to the wider community and to the city but with other groups you need to work where they are and to build them up there so that they will feel secure to start attending other events. But open arts shelter it’s combining kind of psychosocial work like trauma therapy with different types of art, different types of creativity but really on a very, in German you’d say, ‘ungezwungen’ (informal). There’s no goal always. These events are like coming together, being together having a space where you’re not under pressure, where you don’t have to perform because also migrants and refugees, you’re constantly judged, you’re constantly… you have your courses, you have your paperwork, you have to prove yourself all the time. So, just creating spaces for being together for dealing with emotional things going on: stress, sorrow, happiness and then doing that through different types of culture and arts that often can then be used as a kit when there’s no language. There might not be a common language for a lot of those people yet because they haven’t learned German or they don’t speak English. So, art then can create this little space and actually doing things together and connecting people over actually doing things together. What kinds of challenges have you faced or continue to face working with refugees? Well there’s a lot of challenges and there’s a lot of joy and there’s a lot of potential but I think the main challenge is how integration is perceived in the political discourse and from policy makers and stuff and what we’re doing is a very grassroots-driven, soft integration that I think a lot of politicians, a lot of money givers they don’t understand because again they’re obsessed with this type of really measurable impact. We don’t do, for instance, traditional mentoring projects because when you come in, you come into our network, we don’t put you together with one German person to become your German friend because that can be a bit patronising and creating this kind of weird dynamic, it doesn’t have to but we know from experience that it can do. But a mentoring project like that is very easy to track because you have those 20 people going into this mentoring project, whereas we then just act as this huge community and network with 100s of people involved every week, but that is then hard to track, so to say, or much harder than 20 well educated guys from the urban areas of Damascus learning how to start a startup. So, really this is the question of soft integration and what really what makes a person belong and become a citizen of their new city and country. That is something that is challenging for us but then of course you have all the Post-Traumatic Stress among the community, you have the enormous isolation that people still face when they live in big shelters but those are quite obvious things but also it could be easier to work with those challenges if the understanding from the political side was bigger. How does the German public feel about your work and how do you engage them in it? We had very good feedback. I mean in the beginning, when we started back in 2013, our model was a little bit weird for some Germans because what we do, one of our main things that we do is we make migrants volunteer in other local social projects and in the beginning it could be like, “Why, what could possibly migrants contribute?” And so, in the beginning this was seen as a little bit weird, that migrants wouldn’t have skills, and knowledge, and energy, and curiosity when they come. So, that was one of the first things that we noticed. But we were also becoming sort of a darling project because we were one of the first who worked so broadly and were really engaging in a lot of different communities in our work. But, of course, we have to answer a lot of stupid questions and narratives, we’re working very hard to change the narratives around migrants and refugees but that’s also like a part of the job but also because we’re mixing, all our volunteers are mixed. There’s not one single project where there’s only Germans helping refugees but the teams are always really multinational and multicultural, so there’s always someone Syrian in there, there’s always someone with a Muslim background, different languages, Russian, French. And then mixed with Germans, so to say, so that way also the Germans are sensitised and also get a broader view over the whole question of migration. How do you as an organisation fit within the wider German response to refugee newcomers? The Germans are very obsessed with the hard types of integration and by the hard types of integration I mean German courses, getting a roof over your head, housing, and those are very important things, of course, but it’s just the start and its nothing, in our opinion, that first you should get your German course and housing and then you can start with more the cultural integration, such as finding belonging, finding hope, finding friends and networks but they have to run parallel. Yes, it is problematic, sometimes I have the feeling that Germany thinks that if you tick all the boxes, if you learn German first and if you find housing, then it’s going to be like the integration is done, but that’s really not how we see it but making citizens of people and making active members of society, you don’t fix that with just sending people to a German course or even like integration courses where you’re supposed to learn about German history. It’s with being together with other people, learning, sharing, being out there in the society, connecting with, not being segregated that this is actually happening. So, there’s a change of mindset that needs to change in the next couple of years. Economic access and empowerment are two obstacles that drove one migrant woman in Malta to form her own organisation. Umayma Elamin formed the Migrant Women’s Association in 2015. She’d found her challenges of finding work and being independent were shared by many other migrant women. Can you believe that this organisation, Migrant Women’s Association, comes from my needs because when I come here to Malta, my husband was looking for the children and everything but at the same time I try my best to find an opportunity to work but I didn’t find an opportunity to work, or, we could say I was unsuccessful. Until I got involved in volunteer work and through volunteer work I met many people who are activists and they tried to guide me to find a way that I can help, and at the same time, find a way to help me personally. For example, I met Claudia, Chief Executive Officer of SOS. She guided me to build this platform for Migrant Women because I spoke with her about the trouble I faced and how I didn’t have access to the labour market. She told me, ‘Umayma, if you can build a platform for migrant women you can see this problem and you can start thinking about how to overcome this as a group, not just you only.’ And from this point we start thinking about a platform for migrant women and gradually until we founded Migrant Women Association Malta. So, the main issue of Migrant Women is to help migrant women, to empower migrant women and help them to integrate with the Maltese community. This is the challenge I face. You can’t integrate unless you have financial independence and that’s something we still work on to help migrant women to have opportunity, to have access to the labour market, empower them and at the same time integration with the Maltese community. What sorts of things do you help empower migrant women with? First of all, to be honest, at Migrant Women’s Association we start to find out ‘what’s the problem’ and we start by doing research on the obstacles and barriers that face migrant women getting into the labour market. According to these barriers and these investigations we start our planning. For example, we found that communication is a huge challenge for most of the migrant women looking to get access to the labour market. Most of them don’t know English or, for example, they find difficulty communicating in Maltese. For that reason, we start in communication sessions, English courses in improving their English conversation. At the same time, for example, we found some women who have high skills or high qualifications but at the same time they don’t know how to start the process or procedures to get involved in the labour market. So, we try our best to help them. So, most of our project is related to helping migrant women according to the outcome of the research. Can you give me an idea of how many women you help here? Until now we have been targeting 40 women but it depends on how we help them. For example, English lessons we have 30. But we have another for example cooking, a cooking project. When we spoke about cooking I had an idea to because one of the results of the research was related to the skills that migrant women, we found many women they have skills in cooking but they don’t know how to start. Now we start helping them to promote their skills, for example we participated in one of the music festivals last week and show people that migrant women they can do something. Even we guide them to go to JobsPlus and to get a certificate for handling food and to understand how they can build but gradually. So, the total almost 40 women right now. Within a few months of the creation of Migrant Women, a new project was just emerging. Spark 15 focuses on young refugees and ways to integrate them into Maltese society. Mohamed Hassan is one its founding members and says it started to give young refugees a voice. The educated young refugees started to increase especially at the campus at MCAST (Malta College of Arts, Science and Technology) and we thought of doing this since we know how NGOs work and since most of us have been volunteering with other NGOs we thought of something that was missing in other NGOs, the authentic voice, the actual voice of refugees and we thought of creating our own NGO that would represent the voice of refugees. Can you tell me more about your campaigning on youth refugee and migrant access to education and jobs? First there is no clear policies for young refugees to enter their education, I’m talking about college and I’m talking about university, tertiary education. So, the lack of policies and also the lack of training from the job plus, for example, when we’re talking about employment. Plus, if you go back a bit to 2008, this country doesn’t even have an integration policy so, naturally it will be difficult for all of us including the locals. So, the clear policies on education and employment will be harder to create if you don’t have an integration policy so everything is connected so you can see the big picture. 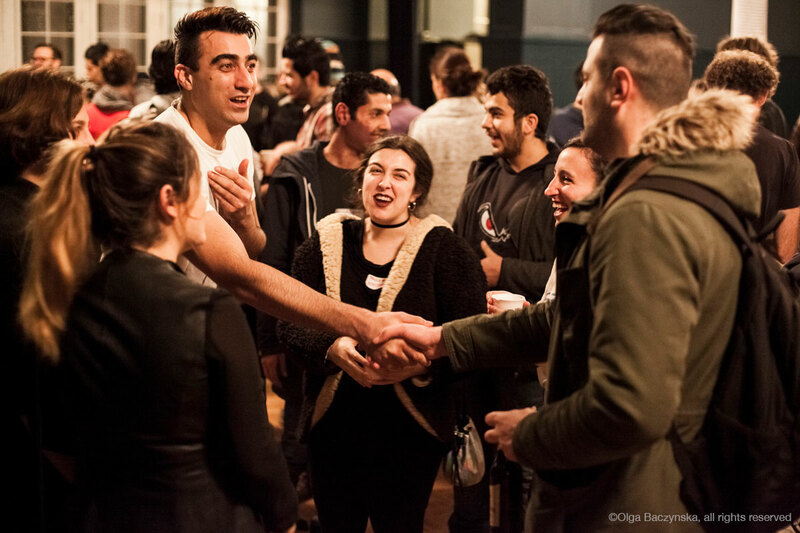 What lessons would you offer other civil society organisations working with refugees and migrants? So, the first lesson is that there is no successful movement without adding a refugee themselves on the board. You cannot speak about someone without including them. If not all, half of the NGOs here don’t have a refugee board member and what I understand is that if you add more refugees the more you will understand the struggle. The other thing is that youth has been very supportive and they need the platform to make their voice heard. Finally, when you look for pictures of the current migration crisis you get people captured at different stages of the journey, but only at face value. Luxembourgish journalist Frédérique Buck wanted to go deeper. With the help of photographer Sven Becker, her project, ‘I’m Not A Refugee’, explored the people and their stories through individual portraits. 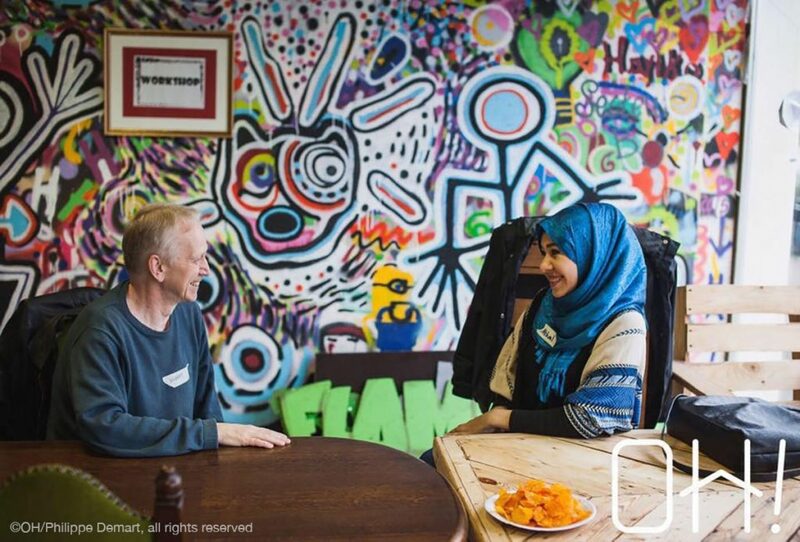 It’s helped connect refugees with their local community and an international audience of over 60,000 people. I met and interviewed asylum seekers and recognised refugees. All sorts of backgrounds: a doctor, a lawyer, a stonemason, students, journalists, mothers, teachers, from Syria, Iraq, Somalia, Palestine or Eritrea. Some of them were very angry when I interviewed them, very angry at the Luxembourgish government because they had the feeling no one was caring for them. They had the feeling that government forgot them and this is because the refugee status determination procedure can be very long. Asylum seekers who wait for their refugee status are generally in huge distress, they feel their life is on hold, they can’t make any plans, they feel totally powerless. So, the anger was quite strong. Today, 12 months later most of the people I interviewed are doing much better: most have found a job and a place to stay. Most have met a lot of people supporting them, most of them have gained independence. Others are still waiting for their status and are feeling very down. What did you discover doing this project? It’s ended now after I published 20 online portraits and edited the iamnotarefugee book. We managed to connect many people. I am developing other projects related to migration and displaced people. I discovered that civic engagement is an incredible social inclusion driver. Each resident can make a significant change to a displaced person. It is striking how quickly people emotionally connect, it takes like half an hour sometimes for total strangers to connect. It is always amazing to witness how easy it is to create bonds. I learned that what newcomers really lack beside work and a place to stay, is a network. Residents have connections, a huge network, especially in Luxembourg as it is a very small country. I witnessed this every day, how residents support refugees by offering their friendship in the first place, but also by introducing them to our society, supporting them in their studies, in their search for a job and a place to stay. Human bonds are at the core of integration. I learned that money can help of course, but can never replace the power of human relations and emotional bonds. As soon as we started publishing the portraits, the feedback was really strong and mainly positive. I was surprised actually when the portraits got viral on the social media, especially on Facebook. I got so many emails thanking me for sharing the stories. I also got hate messages, we do have some right-wing extremism also in Luxembourg. Some persons I interviewed received dozens of emails and contact offers to meet up, even job offers. Today we have 5,700 followers on our iamnotarefugee Facebook page which is really impressive for Luxembourg. It’s not only about thousands of Likes, our follower’s engagement is also very strong. Some portraits are shared or commented hundreds of times. It is a huge satisfaction and joy to be able to make people meet who, under normal circumstances, never would have met. All in all, most of the people I interviewed are better off today as last year. Time is an important factor in integration. Of course, the main step for each person is the government’s acceptance of the refugee status, this procedure can take very long. Interestingly, some refugees didn’t like the slogan, ‘I’m not a refugee‘, telling me that they ARE refugees. Even when I told them yes, you ARE but you are also much more, they wouldn’t understand. It is clear that the word refugee is dividing refugees: while some hate it, others cling to it. I can understand both. So, that brings us to end of Part One of our exploration of people and organisations making a difference to the lives or refugees and migrants. So far we’ve seen how people accommodate refugees and migrants, as well as how they get access to society and ways to change how they’re seen and heard. In the next episode we’re going to continue exploring civil society organisations. We’ll find out about the kinds of problems they encounter and how food can be a way of connecting communities. Until then you can follow us on our social media. Check out our latest updates on Facebook, Twitter, Instagram, Youtube and AudioBoom… or you can support our rescue missions by giving whatever you can to help us save lives at sea. If you liked this Podcast don’t forget to hit like, comment and subscribe for more Podcasts from us. From all of us here at MOAS: goodbye.